One of the many good things of having a Samsung smartphone like the Galaxy S4 is a decent access to the Internet in various ways. For example, you can use your phone to facilitate your Internet connection and share (tether) it with your other devices, including a tablet or PC via a Wi-Fi connection. Indeed it's really a great benefit, but what if something goes wrong? What if all of a sudden you can no longer use your mobile phone's mobile hotspot function? Well, you shouldn't be worried yet, because we're here to back you up in dealing with this issue. This content offers the available means to troubleshoot and/or resolve mobile hotspot problems with the Galaxy S4. It's free, so you may use this article as your reference whenever you think necessary. Don't forget to test your device after performing each of the following methods to see whether the problem is already fixed, otherwise continue to the next steps. 1. Make sure your account is in good status. Please contact your network carrier and verify your account for possible data blocks. This is especially necessary for postpaid accounts. 2. Make sure you are within your carrier's coverage area. 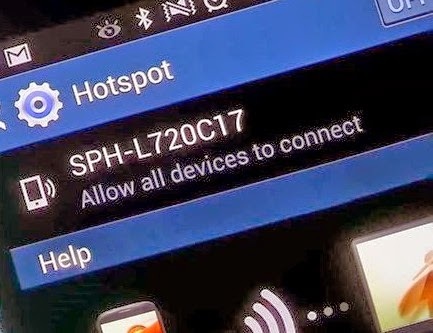 If you are trying to use mobile hotspot in a different area, there is a possibility that you're already out of your ISP's coverage area, which results to data connection/browser issue, particularly on mobile hotspot. 3. Check the SIM card and make sure it's properly inserted. You may need to remove and re-insert SIM card this time, to ensure the problem isn't due to the SIM card. Before you remove the SIM card from your phone, ensure that it is completely powered off. Remove the battery cover first, then take the battery off. Press in, then remove the SIM card next. Wait after a few seconds then re-insert the SIM card carefully. 4. Turn off Airplane mode. Remember, you won't be able to make or receive phone calls or use any data services including Mobile Hotspot if Airplane or Standalone mode is active or enabled on your device. So verify it's settings this time. To check, press and hold the Power button on your device until you're prompted with the options. Select Airplane mode, to turn it off/disabled (if necessary). If the Airplane mode radio button is ticked, then the feature is enabled, otherwise it's off. It has to be OFF or disabled. Just to make sure data is enabled on your device, tap on Apps, select Settings, tap the Connections tab at the top of the screen, tap on Data usage. To enable/disable Mobile Data, tap on Mobile Data. In this case, please make sure it's enabled or a check mark is present. Tap OK, if prompted to save the recent changes you made to settings. 6. Check data usage settings. Tap Apps from the Home screen, then select Settings from the Apps tab. Next, tap on Data usage from the Connections tab. You can also change data usage cycle, if you want. To do so, tap the dropdown menu from the Data usage cycle field, tap on Change cycle, then select your preferred billing cycle date and then tap Set. Touch and hold the red dot located next to the warning line. Drag the warning line to your preferred level then release. Tap on the option to 'Alert me about data usage,' to enable data usage alert on your phone. If prompted, read and review the message then tap OK to complete the process. You may also set mobile data limit, view data usage by app, or restrict data usage by app under data usage settings (optional). 7. Verify if data roaming is set to allow. 8. Verify if Mobile Hotspot is enabled or turned on. Tap Apps from the Home screen, then tap Mobile Hotspot from the Apps tab. Tap on the Mobile Hotspot switch at the upper-right of the screen to enable or disable the feature. If prompted with 'Enabling portable Wi-Fi hotspot will turn off Wi-Fi ' message, tap OK.
9. Verify if your phone can connect to the Internet. Try to open a browser then navigate to a webpage or website, to see if you can access it. Make sure you can access the Internet. 10. Verify and review Mobile hotspot settings on your device. To do so, tap Apps from the Home screen, then tap Mobile Hotspot from the Apps tab. Select the Network SSID name on the upper part of the screen, then select the connection mode option (Allow all devices or Only allowed devices). Proceed by tapping the option to Configure, mobile hotspot settings including the Network SSID, Hide my device, Security, Password, etc. When you're done configuring necessary options/settings, tap Save. If problem persists after completing the aforementioned procedures, then try to delete and then re-create the Wi-Fi connection on your device. Don't forget to reboot or restart your device afterward. If all else failed to fix the problem, then please contact your network carrier and escalate the issue for further troubleshooting and/or recommendations. Also check for network outages that may possibly affect your data connection, particularly the Mobile Hotspot. Please note that if you enabled or turned on Mobile Hotspot on your device, other Wi-Fi services will be disabled.